Chesney Hughes hit a brilliant 171 not out as Derbyshire frustrated Yorkshire on the opening day at Headingley. Following the early loss of Billy Godleman (2), Hughes combined with Wayne Madsen (93) to put on 258 for the second wicket. Yorkshire came back to dismiss Madsen, Shiv Chanderpaul (4) and Wes Durston (3) in the evening session. But Hughes was defiant, going on to make a career-best score to guide Derbyshire to 302-4 at the close. 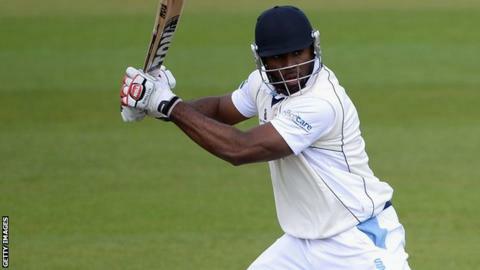 Chesney Hughes becomes Derbyshire's first centurion of the summer. His 171no, including 25 fours and three sixes, was a career-best score. Rain had delayed the start by 45 minutes after Yorkshire had won the toss and elected to field, hoping to capitalise against an out-of-form Derbyshire batting order whose highest total in five innings so far this summer was just 256. And it looked to be more of the same when Godleman was caught by Joe Root off the bowling of England team-mate Tim Bresnan. But Madsen joined 22-year-old Hughes at the crease and the pair batted together for nearly 70 overs, with the former's 93 coming off 195 deliveries. The 256-run partnership was only one short of equalling the record for the second wicket at Headingley in Yorkshire first-class matches. Although Steven Patterson, the pick of the bowlers with 1-47, eventually took the wicket of Madsen in the final session before Chanderpaul and Durston both fell soon after, Hughes, supported by Dan Redfern (14no), remained at the close on 171 not out - an innings which included 25 fours and three sixes.